Drones or their equivalent have long attracted political and military leaders dreaming of the surgical removal of their enemies. In 1812, the governor of Moscow, Count Rostopchin, devised a plan to get a hot-air balloon to hover over the French lines at Borodino and drop an explosive device on Napoleon. The source for this is the memoirs of the French writer, traveller and politician Chateaubriand and I have not read it anywhere else, but the story illustrates how, from the first moment man took to the air, he has seen it as a means of assassination. President Barack Obama thinks much the same way as Rostopchin did 200 years ago. The enhanced and secret use of unmanned drones is one of the most striking features of his foreign policy. During his presidency they have been used against Pakistan, Yemen, Somalia, Afghanistan, Libya and Iraq. In Pakistan alone some 337 CIA strikes have killed 1,908 to 3,225 people since 2004, according to the Washington-based New America Foundation. Of these, between 1,618 and 2,769 are said to have been militants. The precision of the numbers, combined with the great disparity between the highest and lowest figures, will send a chill through anybody who has examined US air attacks in Iraq and Afghanistan. Official mendacity about civilians killed has been a feature of every air war. Within days of the fall of the Taliban in 2001, the US military was trying to explain away why it had blown up Afghan wedding parties that it claimed were convoys of “terrorists”. What makes Obama’s drone wars so important is that they are right at the centre of foreign policy in South Asia, the Middle East and North Africa. Drones were used by George W Bush between 2004 and 2008 on a smaller scale, but their mass use since is not just the fruit of technical developments or tactical convenience. One of the most important changes in world politics over the past decade is that the US has failed to win two wars, one in Iraq, the other in Afghanistan, despite deploying large and vastly expensive land armies. Equally telling, these failures were against relatively puny forces of guerrillas. For American hardliners and neo-liberals these wars were designed to lay the ghosts of Vietnam and Somalia, enabling the open use of US military might, but they turned out to be Vietnam and Somalia revisited. American popular and establishment support for military intervention abroad using ground troops is at a low ebb. The use of unmanned drones seems to avoid these problems. First of all there are no direct and immediate American casualties. The attacks also sound as if they are carrying the fight to the enemy in the shape of al-Qa’ida, with its top 20 operatives in north-west Pakistan being regularly eliminated – only to be mysteriously replaced by another top 20 operatives. Drone strikes have been difficult for the Republicans to criticise during the presidential campaign without opening themselves up to charges that they are soft on terrorism. In one of the few sensible remarks on foreign policy in the presidential debates, Mitt Romney said “we can’t kill our way out of this”, but later added that this did not mean he was anti-drone. 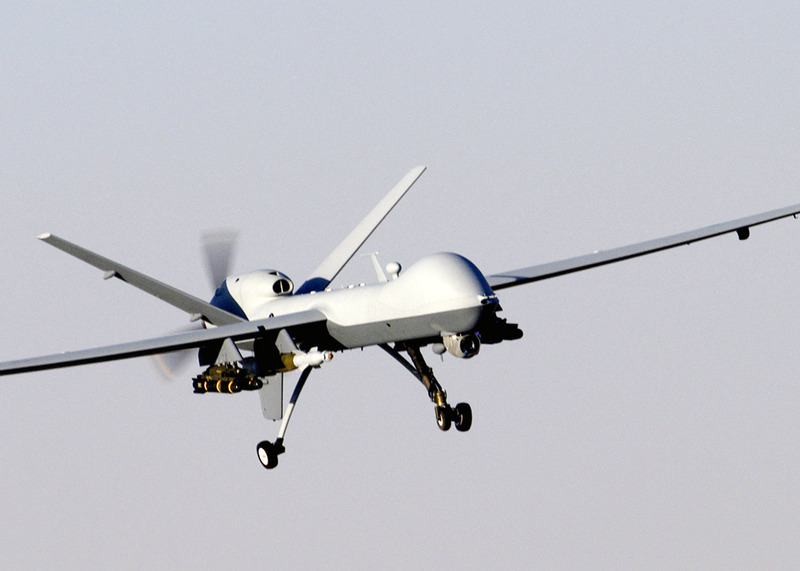 From the White House’s point of view, drones have the great advantage of being largely secret. Richard Nixon and Henry Kissinger were once denounced as war criminals for waging a secret bombing campaign by B-52s on Cambodia. The official silence over today’s drones can be justified by claiming that this is a covert war against al-Qa’ida waged by the CIA and the US Joint Special Operations Command, and requires secrecy to be effective. Are the drones as effective as claimed? Air power has always over-sold itself as being cheap and deadly compared with ground forces. It was first used by the Italians in their colonial conquest of Libya in 1911. Britain’s “Bomber” Harris, who led the RAF Bomber Command during its mass raids on Germany in the Second World War, cut his teeth devastating Kurdish villages in Iraq in the 1920s. Air power can deliver much, but it cannot deliver everything. This is as true of drones as it is of B-52s. The drones make more political sense at home than military sense abroad. Whatever the accuracy of the missiles, targets must still be identified before they are destroyed, requiring good local information. Where the local state is weak or nonexistent, as in Yemen, Somalia, Libya or Waziristan in north-west Pakistan, this is easy to do because the CIA can have its own network of agents or co-operate with local intelligence agencies. But there is something misleading and almost comical about a picture of al-Qa’ida as a tightly organised group along the lines of a miniature Pentagon. It is, on the contrary, much more a series of political and religious attitudes combined with willingness to wage holy war using certain tactics, notably suicide bombing. Drones have other serious disadvantages. They create rage in the countries where they are used, such as Pakistan. If, as is evident, they are carried out with the connivance of Islamabad, this discredits the government as American proxies. Exact figures about civilian casualties are often mythical since outsiders do not know who is living in family compounds in Afghanistan or north-west Pakistan (witness the time it took for US intelligence to find Osama bin Laden in his Abbottabad compound). Many places where drones are used are inaccessible to foreign or even local journalists. Civilian casualties can be minimised or denied. I reported in 2009 a US bombing raid on three villages in Farah province, south of Herat, which killed 147 people, according to locals. There were craters 30ft deep which a US spokesman cheerfully suggested had been made by Taliban fighters throwing grenades into houses. This was an obvious lie, but it was impossible for journalists to prove the opposite. Of course, local people knew what had happened. They drove their tractors pulling trailers full of body parts to the provincial capital where government soldiers opened fire, killing three of them. I wondered at the time how many of the surviving young men of the three villages, and in the rest of Farah province, joined the Taliban because of that bombing raid. Drones do not change very much on the ground. They do provide political camouflage at home and abroad, concealing the US retreat in Afghanistan and Iraq. They store up trouble because they may create more enemies than they eliminate. They rely on a network of informants that can only be established in weak, failed or failing states. They also invite other states such as China and Russia to invest in drones to kill their dissidents beyond their borders. Secret assassination campaigns by drones, hot-air balloons, bombs or rare poisons all carry the risk that somebody, somewhere is plotting their retaliation.